Yesterday I said goodbye to another synthesizer module. I packed it up into a box and now it is on its way to the interior of Japan, where a new owner will nestle it into a new rig and where it will make new sounds in a new context, amid a new set of modules. I bought this module used from Toronto. I don’t know where it was before that. 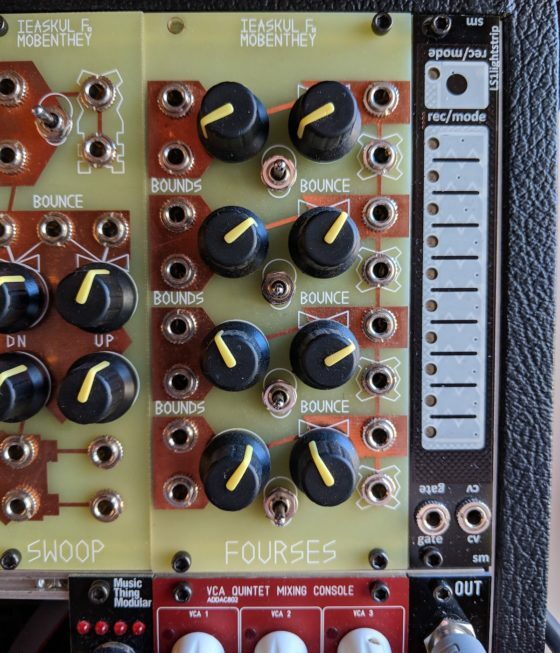 Many modules will emit some sort of sound on their own if you push them hard enough — well, almost all still need to be connected to a speaker somehow — but almost all modules are intended for use with other modules, as a local network passing audio as well as commands in the form of electricity. When a module is in the rig, its innards go out of view. I often joke I wish I had a Lucite case for my modular synthesizer, so those innards, the close stacks of printed circuit boards (PCBs), were always available to be pored over. Part of the joke is I can’t stand Lucite, but the real impossibility of the joke is that a rack’s power supply, interior wiring, and structural support would occlude even the most transparent of synth boxes. 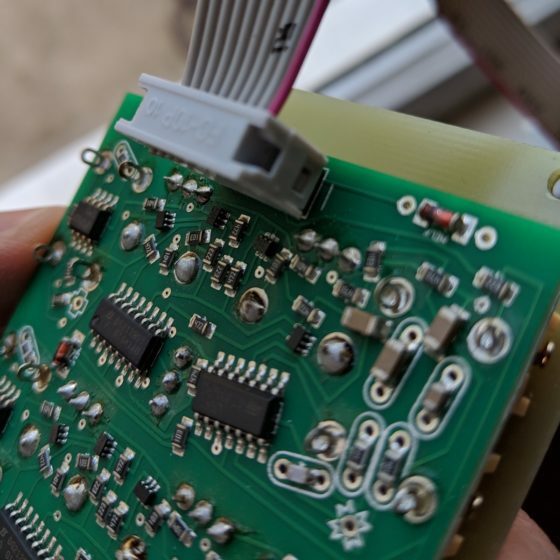 Once a module is installed, its underbelly is disguised by a faceplate, knobs, and jacks. 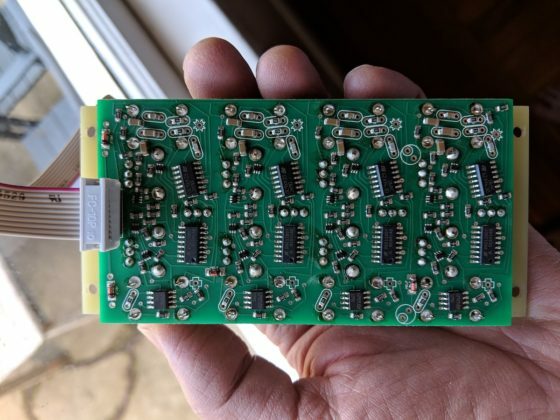 Some of those synthesizer PCBs are wildly colored and arcanely inscribed, while others are as generic as the materials that allow your microwave to heat popcorn. Much of this is purely aesthetic, but aesthetics mean something. If the utilitarian appearance of one speaks of a company’s goal to reduce costs and perhaps a mission to make widely available what was once lavishly expensive, the filigrees of another’s speak of the whimsy, the fantasy, at the organization’s — often, an individual creator’s — heart. I’ve wondered about the intentionality and readability of these visual characteristics previously (at length — see my article “Is the Printed Circuit Board a Form of Musical Notation” at NewMusicBox) — and the upturned module reminded me of just how much I still have to learn. This module in my hand is of a fairly homebrew variety. It is from the Ieaskul F. Mobenthey family, designed by the inventive Peter Blasser. Some are made by Blasser himself, while others are built in synth workshops that he runs, like some PCB Johnny Appleseed. 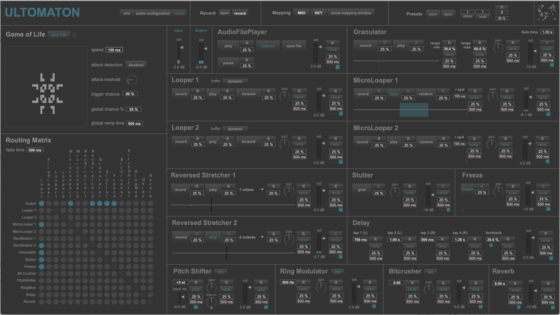 The module goes by the name Fourses, because it is designed around a quartet of oscillators, the circuits that produce the frequencies we experience as sound. Before I mailed off this module, I did what I always do during a sale. I investigated it for any shortcomings. What struck my eye were the paramecium-like formations of this tiny machine’s even tinier components. A chip resembles a little bug under most circumstances, but the asymmetrical, angled gang here have the look of things scurrying intently. Exposing the underbelly of the module felt like pulling a rock from a garden and exposing all sorts of wriggly life. The relative sizes and shapes of these things, how they’re all nestled together as part of coherent integration, suggest the presence an ecosystem. And the lines seen in the green of the board, often committed with rectilinear certainty, here have a topological quality, the squiggles of a mapmaker making sketches of new territory — territory explored subsequently by the people who, over time, invite the module into their sonic world.